This is another Summit in the Woomargama National Park, standing some 1,000 metres above the Murray River valley near the township of – you guessed it – Jingellic. Having activated three previous Summits in the park I was keen to try this one, and the VK2 activity day booked for 13th October seemed like the perfect opportunity. The topographic maps of the area do not show any access trails to the Trig point, though I knew that could not be right as there is a commercial repeater installation up there that would require vehicular access from time to time. After some searching I found a National Parks map, and that does show an access track called, for some unknown reason, the Tower Trail. 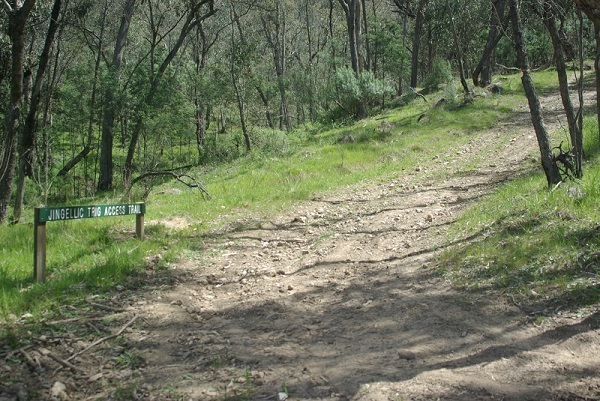 It leads from the end of the Miller Fire Trail up to the Jingellic Trig point. Perfect, or so I thought. Once again I charged the SLABs and packed the Barrett 940 and the link dipole antenna. My lady didn’t come along on this expedition, but she packed me a fantasic picnic lunch so I knew that I wasn’t going to go hungry that day. I set out with the initial intention of getting on to the Miller Fire Trail via the Matthewson Fire Trail, which goes off the Tin Mines Trail and over the shoulder of Tipperary. All went well until I got out of the Woomargama National Park and into a pine plantation, where I came across a very large tree that had fallen across the trail. It was too large for me to attempt cutting it, even with a chainsaw, and the trees at that point were packed too close together to attempt to bush-bash around it. There was no alternative but to go back to square one – the Holbrook to Jingellic Road – and start again via the alternative route. 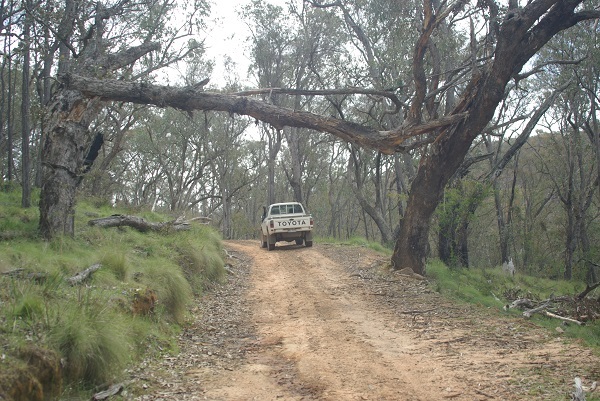 Yensch’s Road is dirt but well graded and leads into the southern end of the Woomargama National Park. The Miller Fire Trail runs off this road, and I made it to that point without further incident though I was now some 30 minutes behind schedule. I followed the Miller Fire Trail for its entire length, clearing one or two fallen trees and bush-bashing around another as I went. One very dramatic fallen tree had made an archway across the trail, and I stopped and had a very good look at that one before driving through. I hoped it would still be up when I returned, as I wouldn’t have been able to cut it or drive over or around it. The Miller Fire Trail ends at a farm gate with a sign on it that makes it quite clear that uninvited visitors are not welcome. Fortunately, from this point the Jingellic Trig Trail – not called the Tower Trail at all if the signs are to be believed – turns back in a hairpin bend into the Woomargama National Park. This trail is very steep and loose and calls for low range 4WD. In the lower section there are several hairpin bends, one or two of which the Hilux would not negotiate in one take. I had got past the worst of these and was on the last really steep section when I came across a patch of slippery mud. Here I could get no traction at all, so I backed off – all right, I slithered backwards down the hill until my wheels could get some sort of a grip, nervously watching the approaching drop-off in my rear view mirrors – and stopped to eat my lunch and consider my options. Option one was to leave the Hilux where it was and walk the rest of the way. A look at the map told me it was a tad over 4km horizontally and about 600m vertically, with a steep climb up followed by a fairly gentle slope down before a final climb to the summit. I hefted the Barrett 940 dubiously, feeling its 11kg mass on my shoulders. Hmm. A glance at the sky made my choice obvious. Clouds were beginning to scud in from the southwest, and the wind was getting up. I didn’t want to be on that trail when the rain started, and nor did I want to be anywhere inside the National Park if the wind got strong enough to start bringing trees down. I backed the Hilux carefully down the steep slope to a point where it was feasible – just! – to turn it around. I executed a perfect 28-point turn and retraced my wheel tracks onto the Miller Fire Trail and out onto Yensch’s Road, fortunately not encountering any new obstacles on the way. I was half way back to Albury when the rain began, and it fell hard enough to wash off most of the mud I’d collected during the day’s adventures. I was happy with that! Jingellic Trig, VK2/RI-001, had won the first round but I remain determined to get to this Summit one fine day. You can look at all the maps in the world but there’s nothing more useful than on-the-ground reconnaissance – your own, or that of somebody who’s been there a little while before you. Again ..all good info. Next few weekends are full so getting up there soon is fading. Will be in touch. Rod 2TRB is still happy to go ..and via the farmer’s road.